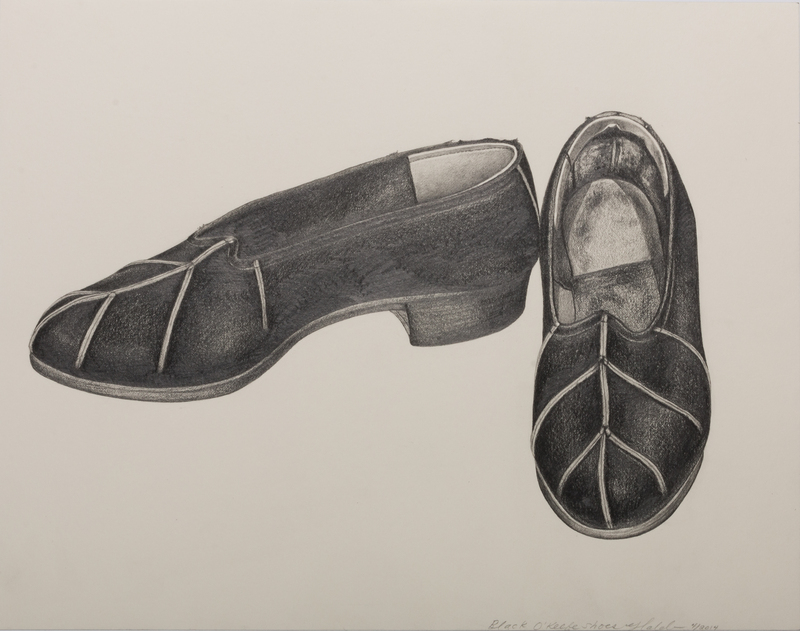 During the Spring of 2014, Santa Fe University of Art and Design – SFUAD – Art student Erin Haldane created graphite drawings of some of Georgia O’Keeffe’s personal effects. 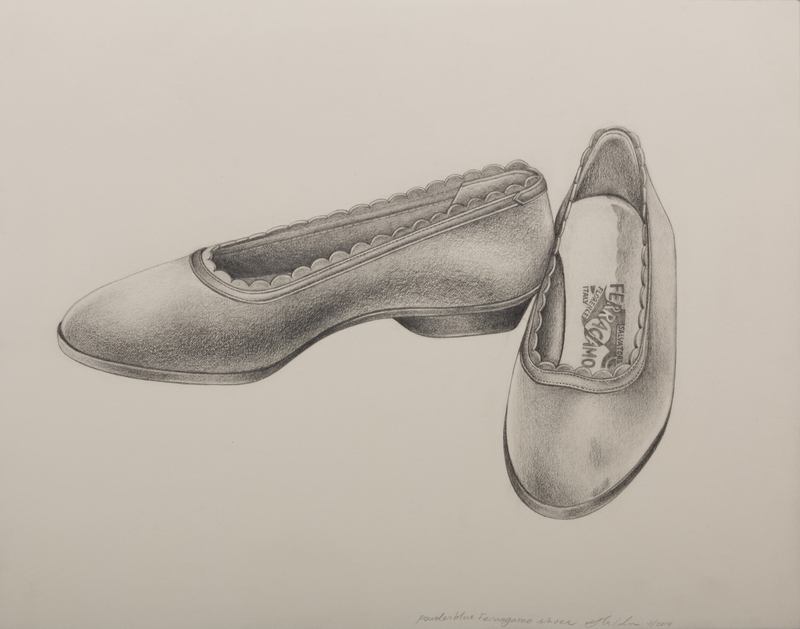 As the first student intern to take part in a new initiative to document objects in the Georgia O’Keeffe Museum’s collection, Erin drew five objects including O’Keeffe’s oil paints, her camping lantern and a pair of her shoes. Art student interns from SFUAD will participate in creating drawings and photographs of these objects which will become a part of the museum’s archive. This Georgia O’Keeffe Museum/SFUAD internship originated from the museum’s desire to document the thousands of objects in its collection, which includes the artist’s clothing, furnishings and personal property, as well as extensive holdings of her artwork. Let’s hear Erin’s experience in her own words! 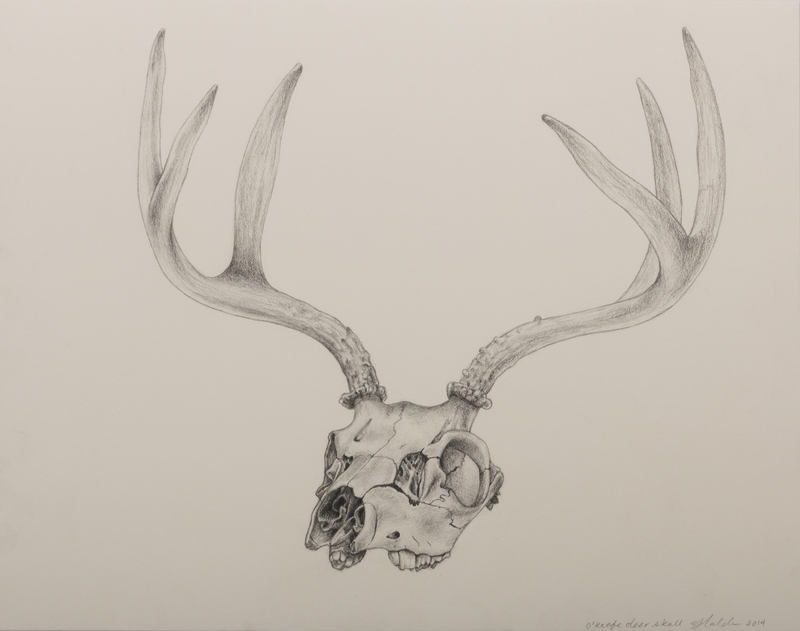 I feel very honored to have been first intern chosen to participate in the Drawn Archive Project at the Georgia O’Keeffe Museum. I had no idea what to expect from the opportunity but luckily, I was not alone there. It was a blank slate for all of us. Because of that, I feel like the project developed very organically, beginning with some tours of the museum vaults and a close look at Georgia’s personal and home life. The goal was to feel-out the items that spoke to me as possessions worthy of being kept, taken care of, and recorded. 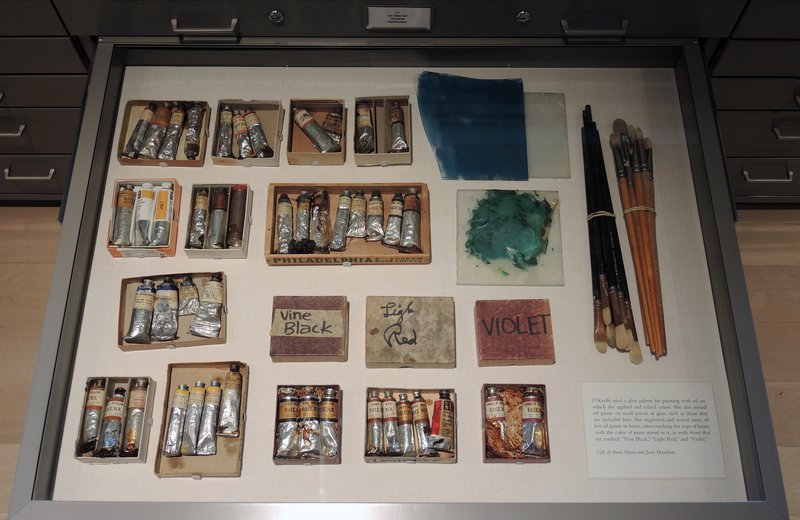 I chose a box of her paint tubes as my first subject because, being an artist myself, I was most immediately drawn to her materials and supplies. One of the things I love about art is being able to see the artist’s hand in the work they do. 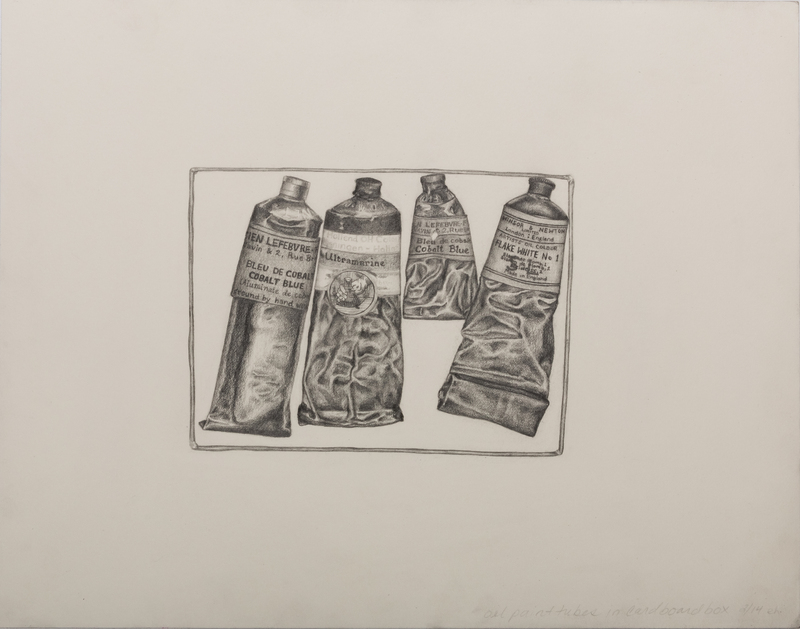 However, this comes through in the mediums they use as well: the wear on the bristles of the paint brush, the hand sharpened pencil, the last nub of a stick of charcoal, and the flattened metal tube which once contained paint. I loved that I could almost see where she squeezed the tube and the varying degrees of paint left in the different colors. Trying to capture the texture of a used paint tube became quite a challenge and an excellent exercise in patience. Upon beginning my first drawing, I figured I would be able to finish one drawing every 4 hour session. 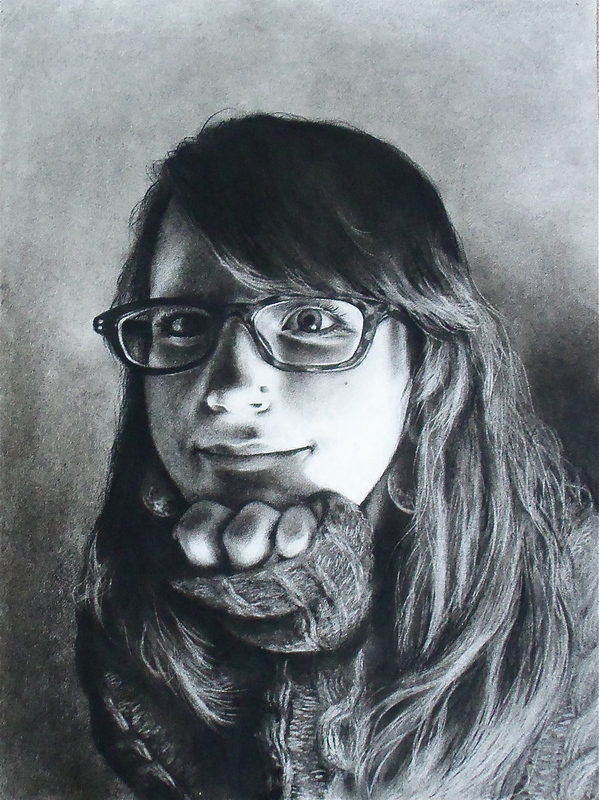 This first drawing took me four sessions to finish. The time spent was definitely worth it though and I feel satisfied with the result. 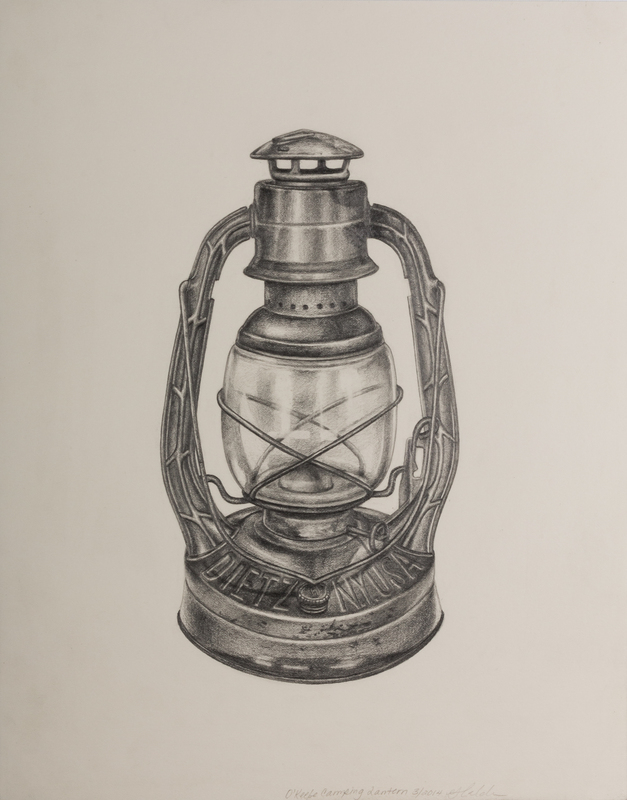 My later drawings explored other areas of her life; For example, her camping lantern, a pair of dress shoes, a pair of work shoes, and one of the many skulls that she had collected. Working to capture the varying textures of metal, suede, canvas, and bone helped me to develop my skills as a draftsman and my skills as an artist. Not all of the other drawings took me 16 hours to finish but they each had their own challenges and rewards from beginning to end. During this time, I was also given the opportunity to spend time with different employees of the museum and learn about their jobs and their roles within the research center. Each person very patiently explained to me what they did, what they were working on, and how they came to be at the Georgia O’Keeffe Museum. I really felt welcomed and the experience really opened my eyes to what happens behind-the-scenes in a museum as well as the wide-ranging careers therein: from the archivist to the registrar, assistant registrar, conservator, and the curators, to even the very dedicated security team (and that was pretty much just in the research center). I really enjoyed my time as an intern at the Georgia O’Keeffe Museum. I learned a lot about the workings of a museum, about Georgia O’Keeffe, her work and her life, as well as about myself and my own practice. I consider the time to have been indispensable to my education and career. I really want to thank Carolyn Kastner and all of the employees of the Georgia O’Keeffe Museum for making me feel so welcome and making my experience there such a positive one.